4L80E - 4L85E ALTO Red-Eagle Frictions Kolene Steels Powerpack For The Direct Clutch. This Is A Super High Quality Automatic Transmission ALTO Red Eagle Direct Powerpack Kit For These GM Automatic Transmissions. This Listing Is For (1) One Kit That Comes With These Components. ALTO PART # 031756HP DIRECT CLUTCH RED-EAGLE AND KOLENE POWER PACK. GM TH400/4L80E Direct Clutch PowerPack Hi-Performance, Racing, Drag Boats, Street Rods ALTO PART # 031756HP Alto # 031756HP POWERPACK® CONTENTS: (7) 031740A. 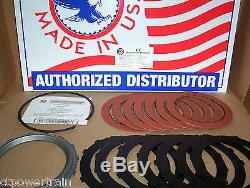 061 / 1.54mm Red Eagle® Friction Plates (7) 031701AK. 060 / 1.52mm Kolene® Steel Plates (1) 031761A939. INSTALLATION INSTRUCTIONS Stack up is the same method as OE. Start with the bottom cushion spring. Install a steel plate then alternately install the friction and steel plates, ending with a friction plate. Install the top pressure plate with the micro-finish towards the top friction plate. Place the direct clutch onto the center support and apply the clutch several times using air pressure. This will seat the friction and steel elements for a more accurate piston travel measurement. 236 (3.07 to 6.00mm). THESE ARE THE KITS THE PROFESSIONALS USE. DON'T SETTLE FOR LESS. PLEASE NOTE: TRANSMISSION REMOVAL, DIS-ASSEMBLY AND RE-ASSEMBLY IS 100% REQUIRED TO. PLEASE MAKE SURE OF YOUR TRANSMISSION PRIOR TO ORDERING YOUR ITEM. CT POWERTRAIN PRODUCTS PART NUMBER: K34304-HP. Please take this into consideration when ordering, as the amount will vary by country and CT POWERTRAIN PRODUCTS does not have access to these amounts. This is illegal in the USA and a Federal offense and we do not break this Policy/Law, EVER. If you are outside the U. WE WILL NOT BE HELD LIABLE FOR LABOR, RENTAL CAR OR INJURY. ALL CONTENT, NAMES, IMAGES, PICTURES ARE PROPERTY OF CT POWERTRAIN PRODUCTS AND CANNOT BE USED WITHOUT OUR CONSENT IN WRITING. The item "4L80E Direct ALTO Powerpack 031756HP Red Eagle Kolene Power Pack Heavy Duty 4L80" is in sale since Wednesday, April 28, 2010. This item is in the category "eBay Motors\Parts & Accessories\Car & Truck Parts\Transmission & Drivetrain\Automatic Transmission & Parts\Automatic Transmission Parts". The seller is "ctpowertrain" and is located in Cerritos, California. This item can be shipped worldwide. Part Brand: Alto Products Corp.